Russian experts revealed the first dedicated mobile phone for Muslims only in Russia and the rest of the world, the new phone has the services and functions are compatible with the Islamic religion. And Al-Arabiya pointed out in a report on its website that the new mobile phone has a full recording of the Koran in both Arabic and Russian in addition to the alarm to remind the user by the time of prayer by geographical location. 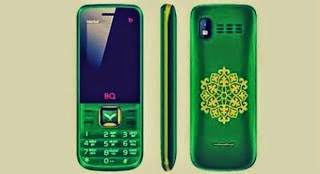 Russia's new phone carries the name and BQ Istanbul is by (Timor Aamaev) A representative of the Central Administration of the Muslims of Russia represents a viable way to help the Muslims across the world in their daily lives, and came after a thorough study by experts worked around the needs of Muslims.